Well this is a wee bit late but since coming home form Europeans I have had to get ready to come back to Uni in Scotland where I currently am now. The Europeans where in Aquilas; Spain, a place I know reasonably well as I have been a few times with both the Irish Squads and also the Stirling crew. This was my biggest race to date, an the highest level of competitors I have raced against, with 4 2012 Olympics. The race its self didn’t quite go to plan, I was aiming for a top 15 finish which I don’t think was unachievable but on the day that didn’t happen, I finished 28th, not too bad for my 1st U23 champs, (I will still have 3 more years in this age category) but it is not where I wanted to finish or feel represents where I am at the moment. I started the day of with a bad swim, I lost my goggles on the 1st lap, at the best of times this can effect your swim, especially when the water is as salty as it was but it was even more detrimental when Varga was at the front setting down the pace. Basically after the swim my chances of top 15 were over. With a group of 10 up the road working well, unlike my chase pack who were happy to give away 35secs per lap. My pack consisted of the likes of Mola and Silva to name but a few who just didn’t want to chase but instead were happy to run it out for positions 10+, which I find hard to understand, because if they had kept a reasonable gap they could have ran into much better positions. After the easy bike I didn’t have the run legs I should have had for some reason, I just felt very flat. I was very disappointed with the performance, but that’s racing and races like this is where I must learn from my mistakes and gain valuable experience. Experience is not what happens to you; it is what you do with what happens to you! Therefore I must reflect and learn from this experience and take it forward into my future races. Next race is the London Senior Elite Triathlon on Sunday 23rd September. Hat trick in the bag. 3 attempts 3x Lord of the lake. 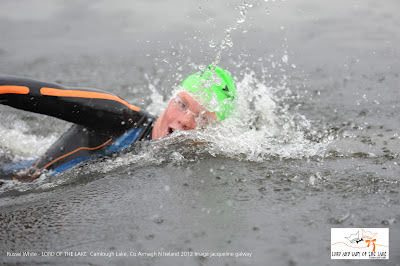 Camlough lake has to one of the nicest place to swim, I’m so lucky that is close. The lord and lady of the lake annual competition is to swim the length of the lake, form one end to the other, a distance of 2.7km. My times the previous years had been 30mins flat and 30mins21secs. So on top of winning the aim was also to break the 30min marker. All went to plan and I managed to smash my time posting 28.14 which I was super happy with. We did have excellent conditions with the lake being completely flat. Aileen had a great swim coming in second and claiming lady of the lake, and beating by previous time and getting under the 30mins in doing so. It is a super event and can’t wait to do it next year. Might even try it non-wetsuit for something different ;) we will have to wait and see.